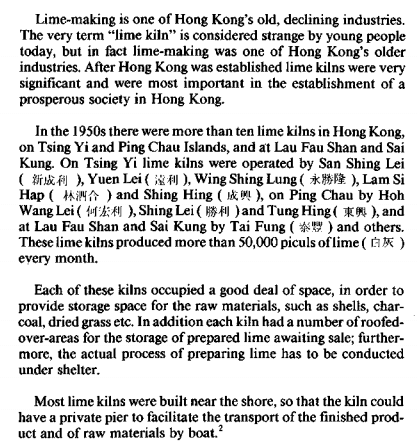 HF: Lime-making in Hong Kong has an extremely long history, at least 1,000 years, probably longer. This article by Wong Tak-yan appeared in the Royal Asiatic Society Hong Kong Branch Journal of 1984. This article was first posted on 16th February 2015. 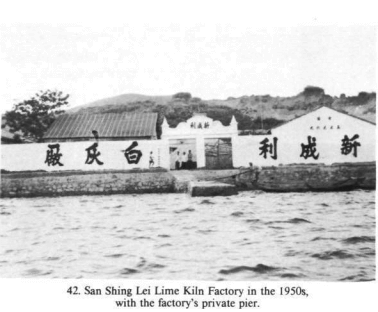 The site of the Shing Lei Kiln in Peng Chau is in ruin but basically in tact. I visited it in December 2013. The main building still exist but locked up. The company sign is still there but it had been fading. Some windows are broken. I did not read anything from the news about the current status of this lot though. 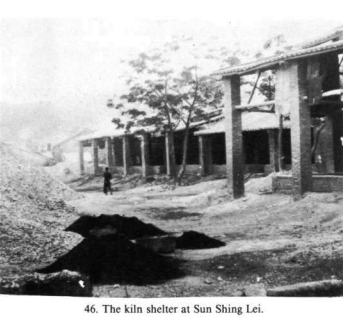 Despite I used to hang out in Peng Chau on weekends when I was twenty something, I have no idea how big was the kiln site.